19 D None No Power Seat 19 D may have restricted legroom due to the position of the Bulkhead. The tray table is in the armrest, making the armrest immovable and slightly reducing seat width. There is no floor storage for this seat during take-off and landing. 19 E None No Power Seat 19 E may have restricted legroom due to the position of the Bulkhead. The tray table is in the armrest, making the armrest immovable and slightly reducing seat width. There is no floor storage for this seat during take-off and landing. 19 G None No Power Seat 19 G may have restricted legroom due to the position of the Bulkhead. The tray table is in the armrest, making the armrest immovable and slightly reducing seat width. There is no floor storage for this seat during take-off and landing. 20 A None No Power Seat 20 A has extra legroom due to the missing seat in front. The tray table is in the armrest, making the armrest immovable and slightly reducing seat width. 20 B None No Power Seat 20 B has extra legroom due to the missing seat in front. The tray table is in the armrest, making the armrest immovable and slightly reducing seat width. 20 J None No Power Seat 20 J has extra legroom due to the missing seat in front. The tray table is in the armrest, making the armrest immovable and slightly reducing seat width. 20 K None No Power Seat 20 K has extra legroom due to the missing seat in front. The tray table is in the armrest, making the armrest immovable and slightly reducing seat width. 21 C None No Power Seat 21 C has extra legroom due to the missing seat in front. However, passengers and crew members tend to bump into this seat because it juts out into the aisle. The tray table and TV are in the armrest, making the armrest immovable and slightly reducing seat width. 21 H None No Power Seat 21 H has extra legroom due to the missing seat in front. However, passengers and crew members tend to bump into this seat because it juts out into the aisle. The tray table and TV are in the armrest, making the armrest immovable and slightly reducing seat width. 30 A None No Power Seat 30 A is a standard Economy Plus seat. 30 B None No Power Seat 30 B is a standard Economy Plus seat. 30 C None No Power Seat 30 C is a standard Economy Plus seat, however this seat is often bumped by service carts or others passing by as there is no seat in back. The close proximity to the lavatories may be bothersome. 30 D None No Power Seat 30 D is in the last row of the section and may have limited recline. The close proximity to the lavatories may be bothersome. 30 E None No Power Seat 30 E is in the last row of the section and may have limited recline. The close proximity to the lavatories may be bothersome. 30 G None No Power Seat 30 G is in the last row of the section and may have limited recline. The close proximity to the lavatories may be bothersome. 30 H None No Power Seat 30 H is a standard Economy Plus seat, however this seat is often bumped by service carts or others passing by as there is no seat in back. The close proximity to the lavatories may be bothersome. 30 J None No Power Seat 30 J is a standard Economy Plus seat. 30 K None No Power Seat 30 K is a standard Economy Plus seat. 31 A None No Power Seat 31 A is missing a window. 31 B None No Power Seat 31 B is a standard Economy Plus seat and is in the last row of the section. The close proximity to the lavatories may be bothersome. 31 J None No Power Seat 31 J is a standard Economy Plus seat and is in the last row of the section. The close proximity to the lavatories may be bothersome. 31 K None No Power Seat 31 K is missing a window. 33 A None No Power Seat 33 A is a standard Economy Plus seat that may have extra legroom due to Exit Row, however the close proximity to the lavatories may be bothersome. The tray table is in the armrest, making the armrest immovable and slightly reducing seat width. 33 B None No Power Seat 33 B is a standard Economy Plus seat that may have extra legroom due to Exit Row, however the close proximity to the lavatories may be bothersome. The tray table is in the armrest, making the armrest immovable and slightly reducing seat width. 33 C None No Power Seat 33 C is a standard Economy Plus seat that may have extra legroom due to Exit Row, however the close proximity to the lavatories may be bothersome. The tray table is in the armrest, making the armrest immovable and slightly reducing seat width. 33 H None No Power Seat 33 H is a standard Economy Plus seat that may have extra legroom due to Exit Row, however the close proximity to the lavatories may be bothersome. The tray table is in the armrest, making the armrest immovable and slightly reducing seat width. 33 J None No Power Seat 33 J is a standard Economy Plus seat that may have extra legroom due to Exit Row, however the close proximity to the lavatories may be bothersome. The tray table is in the armrest, making the armrest immovable and slightly reducing seat width. 33 K None No Power Seat 33 K is a standard Economy Plus seat that may have extra legroom due to Exit Row, however the close proximity to the lavatories may be bothersome. The tray table is in the armrest, making the armrest immovable and slightly reducing seat width. 34 D None No Power Seat 34 D may have restricted legroom due to the position of the Bulkhead. The close proximity to the lavatory may be bothersome. The tray table is in the armrest, making the armrest immovable and slightly reducing seat width. There is no floor storage for this seat during take-off and landing. 34 E None No Power Seat 34 E may have restricted legroom due to the position of the Bulkhead. The close proximity to the lavatory may be bothersome. The tray table is in the armrest, making the armrest immovable and slightly reducing seat width. There is no floor storage for this seat during take-off and landing. 34 G None No Power Seat 34 G may have restricted legroom due to the position of the Bulkhead. The close proximity to the lavatory may be bothersome. The tray table is in the armrest, making the armrest immovable and slightly reducing seat width. There is no floor storage for this seat during take-off and landing. 45 C None No Power Seat 45 C is in the last row of the plane and may have limited recline. The close proximity to the lavatories and galley may be bothersome. 45 H None No Power Seat 45 H is in the last row of the plane and may have limited recline. The close proximity to the lavatories and galley may be bothersome. 6 C None No Power Seat 6 C is a standard Business Class seat facing a bulkhead that transforms into a fully flat bed. There is no floor storage available for use during take-off and landing. 6 D None No Power Seat 6 D is a standard Business Class seat facing a bulkhead that transforms into a fully flat bed. There is no floor storage available for use during take-off and landing. 6 G None No Power Seat 6 G is a standard Business Class seat facing a bulkhead that transforms into a fully flat bed. There is no floor storage available for use during take-off and landing. 6 H None No Power Seat 6 H is a standard Business Class seat facing a bulkhead that transforms into a fully flat bed. There is no floor storage available for use during take-off and landing. 7 J None No Power Seat 7 J is a standard Business Class seat facing a bulkhead that transforms into a fully flat bed. Flyers have reported that this seat has a bit more privacy. There is no floor storage available for use during take-off and landing. The close proximity to the galley and lavatory area might be bothersome. 7 K None No Power Seat 7 K is a standard Business Class seat facing a bulkhead that transforms into a fully flat bed. There is no floor storage available for use during take-off and landing. The close proximity to the galley and lavatory area might be bothersome. Seat Guru's statement that this is a "standard business class seat" is so wrong. Eight across is not "standard" -- never was, never will be. It is almost worst than coach--lack of room, lack of storage, lack of egress. HORRIBLE. Good Economy Plus seat behind the first row of Economy Plus seating. This aircraft does have Premium Plus seating not yet depicted on this seat map. Rows 20-22 are now Premium Plus, rows 23-30 are skipped/not there, and Economy Plus starts at row 32 through row 37. Best Economy Plus seat I've ever had. I didn't even chose it. United has been switching planes on the route from EWR to GRU and I was given this seat the day before the flight. So much legroom, it felt luxurious. And there's a wall right in front which divides Economy Plus from Business. I was able to put my feet up on and and actually slept on the flight, which I usually never do. If your flight is on this plane, grab this seat if you can. The overall seat was great, the only thing that passengers may want to note is that you can't really see the wing from the window. I, being and AvGeek, hoped to capture some good pictures of the wing and engine sitting so far up the plane, but unfortunately, the only thing visible from the window if you look all the way back is the tip of the wing. On the way back, I sat in row 2 and I was able to see both the engine and the wing. Very cramped Economy Plus section with window seat. I traded 26C on the aisle because the entertainment screen was not working for 26C and I didn't mind not having the screen on that leg of my trip (IAD - AMS). This aircraft is showing much wear and tear. The seats are firm and there was no wifi on UA20 or the return UA21. Latches and hinges are loostening and the carpet and seat fabrics are really worn. galley light is disturbing, and the interior lights don't fully extinguish so very bright. row 2 in 1st class is darker. If I had to do it again seat 2A and 2C are the best. The worst business cabin ever with 4 middle seats. May be good to deceive domestic crowd but these seats need to be taken out and replace with the new polaris 1-2-1 configuration. I have no idea why United mention this cabin as polaris business as this is old continental/united configuration. Even Turkish uses 3 middle rown on the 777-300ER and I feel that cramped. If you pay a premium you deserve a better seat and space. Still UA uses this cabin for ORD-HKG, ORD-chinese destinations, before you book check seat config to make sure you get new polaris-not even the new dreamliner have new polaris even for the 17 hour flight from LAX-SIN, as it is 2-2-2 and the window seat has to climb over the person at the isle. New polaris 1-2-1 is superb but the rest of the configurations are sardine packed business cabins like Oscar used to pack cargo while he was at CSX. I didn't take this seat because of the warning on this website, but I went to check it out and this seat DOES HAVE A WINDOW! I would definitely recommen this seat. It looked great. The tv screens on this plane are absolutely tiny! Also the touchscreen is quite unresponsive. Make sure to bring a table with the United app installed because this allows you to watch the entertainment selection on your own screen. This seat is pretty standard. I'm not sure if it was worth paying extra for the economy plus. 4 seats across in the middle section of business class means that if you are in the middle two, you need to climb over the person sitting next to you in order to go to the bathroom. Not what you would expect on a business class fare. Don't even try it unless you're physically quite mobile. I would rate all the middle seats in business as yellow due to this design problem. Additionally, seats were really narrow- felt like I was lying in a coffin. Flew from SFO to LHR. Business class is incredibly cramped. I've never had to fight for elbow room or somewhere to put my drink in business class before. Impossible to avoid being woken by my neighbor when he got up to use the restroom. Zero storage around the seat, not even for a water bottle. My least favorite configuration for united business class. This seat is particularly weird because you will find yourself staring across the aisle at another passenger facing you. There is very little storage in any of the seats on this aircraft. Noise from galley/lav not bad at all in this seat. Flew from Wash Dullus to Brussels. 6K is a good seat due to some extra space between the fuselage and the seat itself so pillow and heavt blanket could be stored. this is a quiet seat as the more the front you are the further away from the galley(kitchen) and the crew talking heads. I didn't find this seat to have much privacy at all, especially since every time you looked in the general direction of the galley you would make eye contact if anyone was there. I found the crew to be excellent but they were a very chatty group so it definitely wasn't a quiet seat either but given the number of people near me who had no trouble sleeping, perhaps it's just isolated to this row? For comparable purposes, I found the equivalent seat on a BA 777 to be 100% more private as they have the screens between the seats and you can't see anyone in the aisle while the divider is up. The bulkhead seats (row 32 on my flight) had a panel underneath them, so the legroom from my seat (33A) was restricted. Not much room for putting a bag under the seat and certainly not enough space to straighten my legs. 19G is an Economy Plus seat with plenty of legroom. I couldn't find this seat's power outlet (so my kind neighbor let me use hers). Food was delicious seats were awesome layed flat and crew too. Flew FRA to IAD in Polaris First. The flight crew were great and very attentive. Food was good except for the main course of the rack of lamb. Too fatty and chewy. Rest of meal was really nice though. Overall, fantastic service! I flew home from EWR-SFO in early november in Business First. seeing that 10C was so close to economy and reading how this might be an issue with noise and the foot traffic. I had no issues at all! this is actually one the best seats in business IMO!! you're far enough from the galley's and bathrooms, so noise and light isnt an issue! Noise from economy wasnt an issue at all!!! the only downside of these seats, not enough storage space. For most other airlines, this would be economy plus, not business class. Cramped seat, too close to the bathroom, very stiff and uncomfortable, minimal service. 2-4-2 doesn't work for a long overnight. United Business First is a waste of money. All you get is a narrow flatbed seat and no privacy at all. You are constantly facing another passenger. Meals are average. Service is OK.
Other than the normal extra leg room you get in the bulkhead row, this seat is not economy plus. Its extremely narrow and the unmoving arm rests (common in bulkhead) make it not worth the increased price. welcome to sardine central people. or welcome to your MRI in the sky. these seats are so narrow that it is impossible to get comfortable. i'm 5'10 and 175lbs. This seat is facing the galley directly as it's backward facing and the light is annoying if you're trying to sleep. Amazing flight. Awesome service and amazing seat. SOO many hidden storage holes. Great flight!! These are terrible seats. The galley and toilets do not align - the toilet doors open right into seats 8C and 8H and the lights from the galley light up that whole row. And because this is United you get the FA's yacking away all through the trip like a bunch of bored stockroom clerks. I would give 8C and 8H red and the rest of the row including the window sections a yellow. The same goes for the other United version of this plane which I flew on the first leg of my trip. Can't lean against the wall comfortably when the seat is fully reclined. The recessed window makes that difficult. This United business class is a biggest joke ever and a waste of money. The seats were outdated. They were too narrow (only 20 inch wide) for any medium-sized person to lay flat/sleep in comfortably. And the terrible layout makes lots of passengers face-to-face to each other and elbow-to-elbow to each other. NO Privacy whatsoever! F!ying from ORD to BRU with my wife we found the seats to be very comfortable with a lot of adjustment. The service was excellent as was the steak. Seats 29 D-E-G and 30 D-E-G are crew rest seats; when available, they have tons of legroom, a fold-up leg rest and plenty of room to recline. Tray tables are in the arm rests and video screens are fold up, not on the seat. 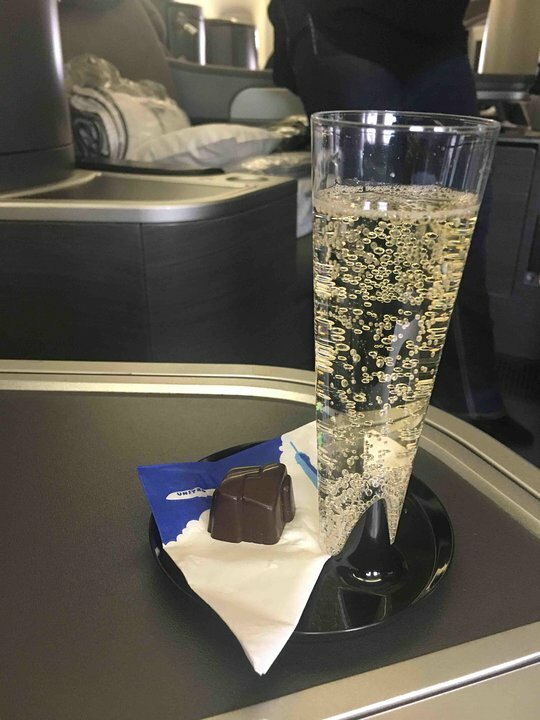 I recently flew United Global First and I agree that it is not a real First Class. It is dated and shabby, the gray color couldn't be any more depressing, the food was adequate, but not very good. There is not privacy from the person next to you when there is no divider. I think I heard the word First Class Suite. If so, that is a joke. United really needs to up it's game an provide a real First Class experience. What they provided is a clunky, dated product. The only thing I think was very good was having your own overhead compartment. However, since I was seated in the overhead, it wasn't the thing I wanted to be most impressed by. And as for their Business Class on this plane, I was shocked to see four adults crammed together. It looked uncomfortable and zero privacy or personal space. Eight across is a crime for a business Class. Poor excuse for Business Class! Eight across only by installing a super narrow seat, no other airline puts eight seats in a 777 business class. Also, absolutely no storage at all, everything to the overhead for takeoff and landing. I originally had selected 1A on this flight because, at the time of reservation, the aircraft was a 747-400. Upon learning of the switch to a 777-200, a friend highly recommended I take 2K instead, due to 2A being a crew rest seat with curtains and 2K not having anyone behind you (partition for beginning of BusinessFirst cabin). 2K was a nice seat. At 6'1" tall, I fit fully on the lie-flat seat in its reclined position. With only two rows, the GlobalFirst cabin felt pretty intimate, but I also didn't feel like it was the nicest First Class cabin on an international airline. The curtains draping the crew rest seat at 2A made the First cabin frankly look cheap and gaudy. The seat directly in front of me, 1K, was also used by crew during the flight as a crew rest seat (8.5-hour flight FRA-ORD). The service was good (not amazing but certainly adequate) with lots of food/wine service. Out of eight GlobalFirst seats, four had passengers and two were used as crew rest. The entertainment system had a lot of choices, so enough to keep busy with for a long flight. Having your own overhead compartment is nice in this cabin. Depending on the gate configuration at deplaning, you may not get to exit the aircraft first, as those of us in GlobalFirst didn't on my flight, because they deplaned only from Door L2 at ORD instead of using both L1 and L2, as had been done for boarding in FRA. As such, we had to walk back and join the long queue already formed to exit the plane. I've not noticed an issue with the backward facing seat on any of my flights going backward (and I get motion sick easily). I had no issue getting over the fully reclined person in 10J. Looking back into the economy cabin, however, is super sketch, they should really have 100% opaque curtains between the two cabins instead of the current mesh. Global first on United is not a real first class product. The seat is certainly big but it is shabby looking and does not compete with any first class offering by other international airlines as well as AA new 777-300's. The overall cabin is run down and cluttered. There is no physical separation between business class and Global First - further blinding the distinction between the two cabins. The bathrooms are too small for a 6'3" physically fit man. They are also dirty and run down. You will definitely be able to sleep as the bed is big and wide. You just need to manage your expectations and realize you are not getting your money's worth on this aircraft. Cotrary to other opinions, flying backwards made little or no difference to my experience. In fact i was able to see the engines while while watching the sun rise. Which was quite surreal. The food was ordinary. However do you fly to eat great food?? The service although rough at the start improved during the trip. Climbing over the bed next to me was interesting but doable. Lack of storage area needs to be addressed. The pillow was a bit lumpy but the blanket comfortable. The intertainment was somewhat dated although worked sufficiently. I was travelling alone and the privacy was sufficient. The business class on this plane is "up-scaled economy class" at best. There is NO other airline which squeezes 8 seats in a row on the B-777. As a results, seats are way too narrow and each row has two middle seats. Also, I cannot imagine that anybody would enjoy the rear-facing seats. For comparison, on the much wider B-747 Lufthansa puts 6 seats in a row (lower deck). To me calling this business class is fraud. Even when the seat recline to a flat bed,wich is nice was the only good thing about the flight. Flying backwards (a very stupid idea for that price)and beeing watched by people from the economy class during the whole flight was more than anoying. The worst service, and flight attentends in my live and terrible food makes me not flying this airline ever again. I've seen lots of comments about the business class lie flat seats, and the window seat passenger being a "prisoner" if the aisle seat passenger reclines. Actually I'm 5'8" (not terribly tall or long legged) and I can actually do a straddle/hop over the aisle passenger's legs while they are asleep without disturbing them at all. Granted it takes a bit of agility but its definitely doable. I'll take that over someone else waking me up to get past me if I were to take an asle seat any day! I would make seat 21C poor. The lack of any under seat or back of seat storage makes it really hard to even have access to a bottle of water. You have to stow the screen during takeoff and landing and the screen is smaller than the other economy screens. I was quite disappointed with my decision to pay for this seat. I would not do that again. First experience with UA's "new" business class product on flight from DC to Tokyo. The space is good and the seat well designed and comfortable. Detractors are the density of seats -- they really packed a lot in. I flew backwards once on BA and became ill, so I was sure to book this forward-facing seat. The AVOD system and selection was EXCELLENT. Detractors are the lack of privacy from your neighbor -- particularly in center section seats. You can always see exactly what your neighbor is watching, and crawling out from the window seat over a deployed bed is very difficult. In addition to lavatory proximity, passengers often loiter immediately in front of the seat because of the large exit row width. No stowage for books or other personal materials also makes reading or working problematic. Overall good business class seats. Full lie-flat but not quite long enough for a 6 foot person to stretch out completely. Foot well is small and cannot really be used as storage. Video system has dozens of movies and games and includes tethered remote with small keyboard. 110v plugs and usb power available. Amenities kit includes toothbrush, toothpaste, eyeshades and socks. Food was decent and plentiful. Flight attendants will open and close galley compartments so you will hear noise the entire flight. Some airports will allow you to board through 1st class. Much better deal if you get a discounted ticket instead of full fare. The seats lie flat and that is good, but this 2-4-2 configuration results in very narrow seats. Not enough elbow room. No privacy. Not comfortable enough for a 5'8" medium frame traveler. So, probably uncomfortable for a larger person. Also, not enough room to place anything, water bottle, book, etc. When flying GlobalFirst, as a "solo" passenger, I highly recommend sitting in seat 1A. While it's close to the lavatories, it's not a bother, as many of the pax tend to walk on the other side. 1A's location gives you a very private, intimate feel, and there's always more than enough overhead storage, as 2A is reserved as a pilot rest seat with a curtain around it. The mattress service is ONLY available on the 777's or on the original United aircrafts, NOT the converted Continental 767's. For a US carrier, GlobalFirst is worth the money. The negative is the placement of the TV. It makes it impossible for a traveling companion to sit on the ottoman and the lack of the "sheer" privacy curtain separating you from Biz Class. It's embarrassing as many Biz pax stare to see what's going on in the F service. Also, 1A means the first to disembark, at airports where door 1L is used, but usually 2L is used, making you have to disembark with the Biz Class PAX, which CAN be a struggle as the FA'S don't assist in giving you priority. Good product for a US carrier, but if loyal to Star Alliance, First Class service much better on LH, ANA, Swiss, and Singapore. Only negative: cold air pours down for the first 4 hours from the overhead luggage compartment. A jacket and UA's blanket are a must. I absolutely love the UNITED GLOBAL FIRST SEAT. It is large, open but still private enough. 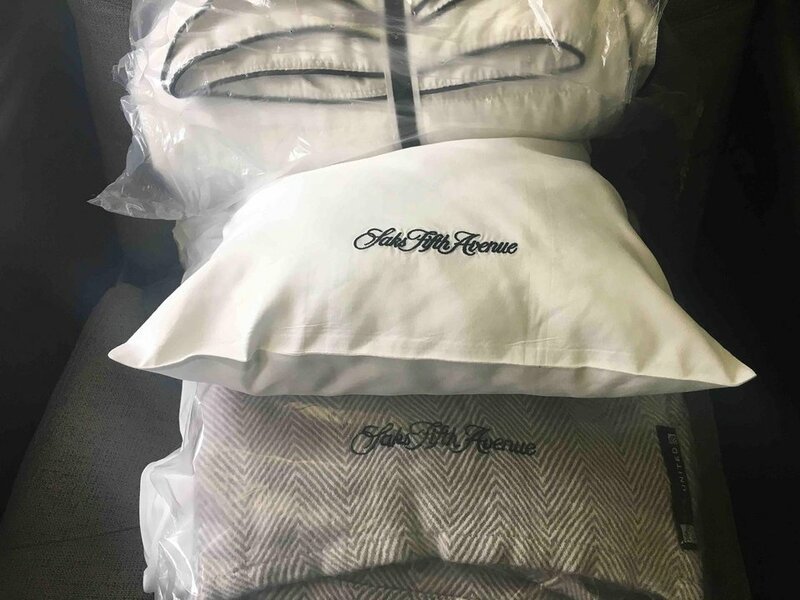 The seat itself is extremely comfortable to sleep on when flat and with the new turndown cotton padded cover and duvet, it is actually dreamy. When I am extremely tired and working very hard, I beg my FD to cover the cost for United First- if the flight is to Brazil or Asia. The slide raft in the exit door sticks out and causes there to be much less legroom in this seat compared to the two others next to it. There's still more legroom than in economy, i think, but its something to be aware of.